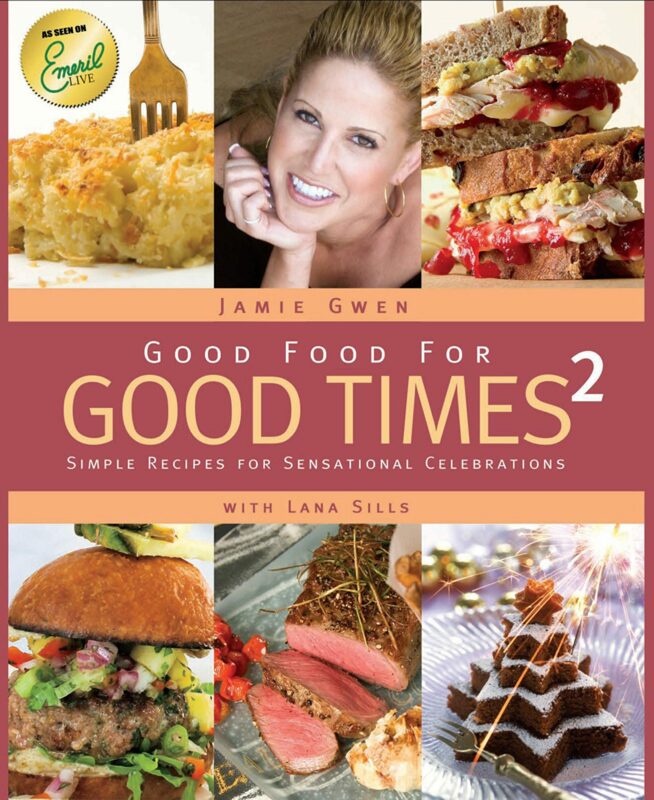 "Good Food for Good Times²" is a newly updated collection of irresistible recipes to celebrate everyday occasions. Jamie Gwen, Chef, Sommelier and radio and TV personality, along with co-author Lana Sills, dish up more than 150 recipes for 26 occasions including family gatherings, seasonal celebrations, holiday happenings and get-togethers for merriment. Stunning full-color photos and simple yet innovative recipes combine in this cookbook, along with Chef's Tips and wine pairing ideas, to help turn every day into a delicious celebration! You'll find recipes for Holiday Happenings, inspiration for Slider Heaven and a new chapter dedicated to Bacon, Bacon & More Bacon! "Emerilized" Hot Clam Dip (As Seen on Emeril Live! ), Bacon Fried Chicken and Smoky Brown Sugar Baby Back Ribs are just a few of the new mouthwatering dishes! Learn to make the Ultimate Double Cheeseburger Sliders and Salmon with a Jalapeño Hollandaise, perfect for entertaining. And, to end your meals on a sweet note, you'll find recipes for an Espresso Icebox Cake, Peanut Butter Cupcakes, the most incredible Double Lemon Bars, a Brown Butter Pecan Pie and more. With chapters that include menus for Autumn Nights and Afternoon Tea, gifts of food, cocktails to toast with and special celebration sweets, Good Food for Good Times² offers an enticing alternative to the traditional cookbook by offering you a full menu for every family gathering, celebratory dinner or outdoor feast. Complete with more than 150 recipes, dozens of cocktails and 30 stunning photographs along with Chef's Tips and Wine Pairing Tips, this cookbook will be the manuscript you will always turn to for everyday get-togethers and special occasions.